Mirror cabinet 60 cm – White. Matches cabinet ref. 002639. Mirror cabinet 80 cm – White. Matches cabinet ref. 002641. Mirror cabinet 60 cm – Anthracite. Matches cabinet ref. 002639. Mirror cabinet 80 cm – Anthracite. Matches cabinet ref. 002641. 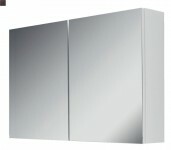 Mirror cabinet 60x15x76 cm 2 doors – White. Matches with cabinet ref. 002667. Mirror cabinet 80x15x76 cm 2 doors – White. Matches with cabinet ref. 002668.